Chief Martin Brody (Roy Scheider) doesn’t exactly say that line in 1978’s Jaws 2, but he might as well have. Despite saving Amity (which, as you know, means Friendship) in Steven Spielberg’s 1975 blockbuster masterpiece, the ocean-phobic, former NYC cop is forced to beg the town elders (still led by the oily Mayor Vaughn, played again by Murray Hamilton) to believe that a massive great white shark is once again treating the waters off the island like its personal buffet. Despite what happened just a few years before, and the consequences everyone suffered from inaction (RIP Alex Kintner), the higher-ups of Amity Island ignore Brody’s warnings. In fact, they go so far as to relieve Chief Brody of his job, promoting the hapless Deputy Hendricks (Jeff Kramer). Well, that’s a longer story than we have time for, but suffice it to say that neither Chief Brody nor the man who played him wanted any part of another shark adventure. After the groundbreaking success of Jaws, Universal Studios put a sequel into production, with director John D. Hancock (Let’s Scare Jessica To Death) at the helm. 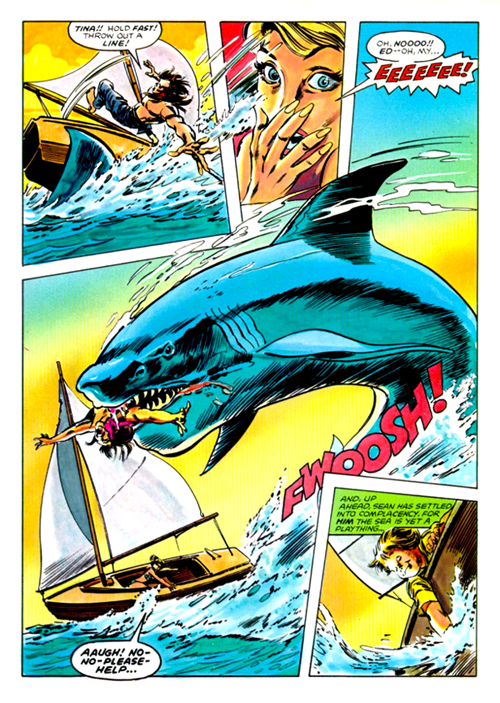 Hancock’s story was more downbeat, showing Amity as a community financially ruined by the shark attack, filled with closed-up businesses and empty streets. After only a few weeks, the studio decided they wanted something more light-hearted and adventure-y, and ordered Hancock to revise the screenplay. He refused, and after a few run-ins with studio personnel, he was fired off the movie, to be replaced by Jeannot Szwarc (Supergirl). Coming onto a movie a few weeks into production has to be hard enough, but Szwarc also had to contend with a very unhappy leading man—namely Scheider, who did not want to do Jaws 2, and was essentially forced into it by Universal when they played hardball with his contract. Without reading too much into any given scene Scheider is in, you get a sense that the weariness Brody is feeling by dealing with all of this again is coming from the actor, who was going through the same thing every day on the set. Without his two amazing co-stars (Richard Dreyfuss and Robert Shaw) to bounce off of, Chief Brody looks like a man, er, at sea. Apparently Scheider was miserable during shooting, at one point even getting into a fistfight with the director. Maybe he knew he was souring the legacy of the first film by appearing in this decidedly inferior follow-up. Watching Jaws 2 again, it’s not as terrible I as remembered it. Sure, it’s no Jaws (few films are), but it does have some genuine scary moments by eschewing Steven Spielberg’s Men’s Adventure tone for more straightforward horror—there are a couple scenes where we get big close-ups of the shark chomping down on people, and the shark looks suitably real enough to evoke genuine revulsion. The main problem is that Jaws 2 doesn’t replace Hooper or Quint with any character as captivating, instead giving us a bunch of whiny teens who scream at each other scene after scene, so you find yourself rooting for the shark. It also gives two supporting characters from the first film, Ellen Brody and Mayor Vaughn, increased roles, which does neither any favors. The original Jaws was a troubled production, and no one thought it would be a hit, let alone hold the record for the most successful film of all time (until another young punk, George Lucas, released that little sci-fi movie two years later). There was precious little merchandising done for the film (save for an awesome game by Ideal, which was played by the author for hours on end), so when the second film was announced, merchandisers knew not to miss the boat: There were Jaws 2 trading cards, books, soundtrack albums, paper cups, beach towels, as well as a comic book. Marvel Super Special #6 was written by Rick Marschall and drawn by the incomparable team of Gene Colan and Tom Palmer, who also did the colors. With more than 40 pages to adapt the movie, Marschall does a pretty decent job of hitting all the major plot points and dialing down the film’s seemingly endless scenes of Brody squabbling with his wife, Mayor Vaughn, the sail-boating teens, etc (we even get a sense of what Hancock’s Jaws 2 might have been like, for the Marvel comic features scenes from the original screenplay). 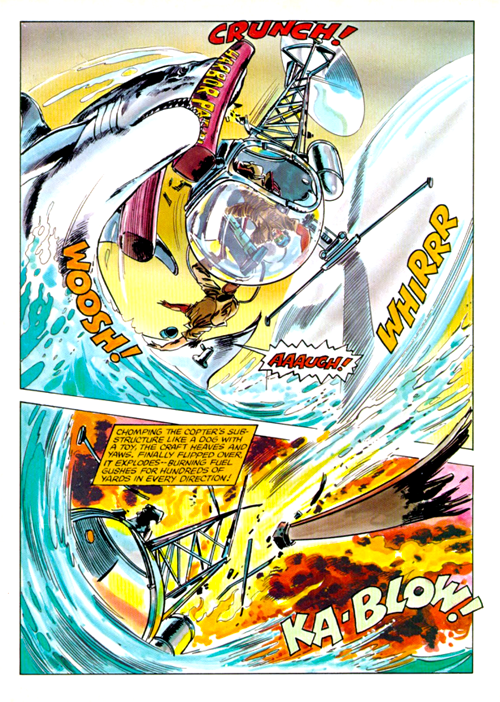 For his part, Colan decided to bring some of that Marvel razzamatazz and give us a shark a hundred times scarier, bigger, and more aerodynamic than the one seen in the movie. I mean, really, check out this shark—it could have probably swallowed the Baxter Building whole! Except for that last part, he was right on the money. Speaking of money, despite all the problems and lukewarm critical reception, Jaws 2 was a massive hit, becoming one of the biggest moneymakers of the year. I distinctly remember seeing it in the theaters during its original release, and even though it didn’t pack the punch of the original, it still scared the bejeebers out of me, and kept me from ever wading too far out into the ocean. In fact, Jaws 2 was the highest-grossing sequel in history until—you guessed it—George Lucas released The Empire Strikes Back, once again snatching a box-office record from a shark’s toothy mouth. 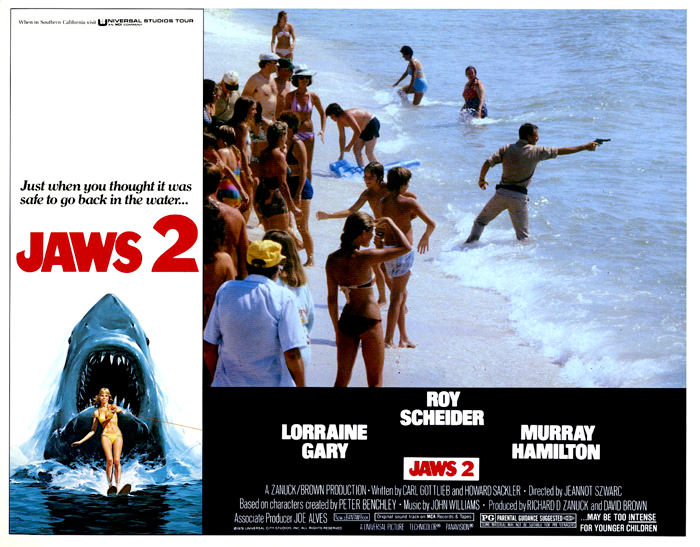 Jaws 2 was re-issued in 1980, and Universal, not knowing when to quit, put Jaws 3-D into production. I can only imagine by that point they didn’t even bother approaching Scheider, who probably would have attacked any Universal executive carrying a Jaws script with a harpoon gun. If for some reason you feel compelled to watch Jaws 2, go right ahead. There are worse ways to spend two hours (the aforementioned Jaws 3-D and Jaws: The Revenge being two fine examples). But I would recommend finding a copy of Marvel Super Special #6 instead: It’s a lot more fun, plus you get page after page of glorious Colan/Palmer art. I think even Chief Brody wouldn’t mind looking at a shark drawn by those two guys. Rob Kelly is a writer/artist/comics and film historian. He is the co-host of The Fire and Water Podcast (and the host of its sister show, The Film and Water Podcast), the co-creator and writer of the award-winning webcomic Ace Kilroy, and the creator of the book Hey Kids, Comics! : True-Life Tales From the Spinner Rack. He is still afraid to go into the ocean.